BRCA1 and BRCA2 are human genes that produce tumour suppressor proteins. These proteins help repair damaged DNA and, therefore, play a role in ensuring the stability of the cell’s genetic material. When either of these genes is mutated, or altered, such that its protein product either is not made or does not function correctly, DNA damage may not be repaired properly. As a result, cells are more likely to develop additional genetic alterations that can lead to cancer. Find out how genes and mutations play a part in cancer development. Women with the BRCA gene have an increased risk of developing breast cancer at a younger age. Find out what your risk is compared to other women and how to manage your risk. The decision about what type of risk reducing surgery is a very important one and one that you will make in discussion with your breast care surgeon and breast care nurse. Find out what your options are. 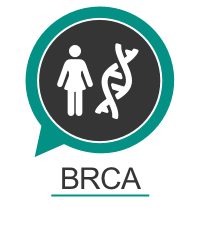 Find out what the risk of BRCA carriers is compared to other women of developing ovarian cancer and how to manage your risk. A risk-reducing BSO is the removal of a woman’s ovaries and fallopian tubes before ovarian cancer has occurred. Find out who it is offered to, how it is performed and what to expect? Learn about residual risks of breast and ovarian cancer and your new breasts. The Menopause may occur if the ovaries are effected by treatment or surgically removed. HRT may not be suitable for women with a history of breast cancer. Learn more about Menopause & HRT if you are a BRCA carrier. You may find talking to your children about the presence of a faulty BRCA gene difficult. Learn keys ways to deal with this. Men carry BRCA genes, they will have a slightly higher risk of developing certain cancers. Find out what are the cancer risks. For a couple where one parent carry a BRCA gene there is 50% risk that their child will inherit the BRCA mutation. Find out about Pre-Implantation Genetic Diagnosis (PGD) and Egg/Sperm donation. Women with the BRCA gene have an increased risk of developing breast cancer at a younger age. This video series, kindly supplied by Cancer Genetics, describe how inherited genetic alterations influence your risk of cancer, and what you can do if you find out you do have these genes. To download our breast cancer information, click here.